In this article, you will know about Google's launches on Android NanoDegree program, admission and scholarship in association with Udacity and Tata Trusts, herein Bangalore, India. Check this article to know more detail about how to apply, eligibility, age limit, fees and other required detail to obtain Android NanoDegree. Learn on how to get Android NanoDegree program 2015 admission and scholarship. 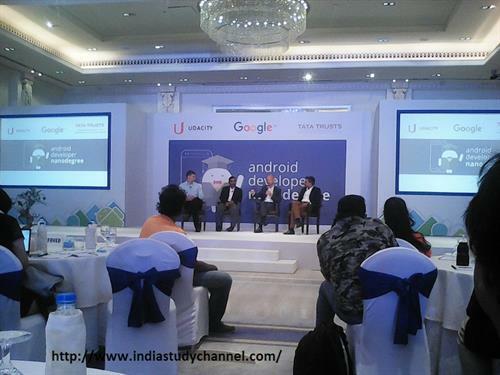 On 21st Sep 2015, Google, Udacity and Tata Trusts jointly announced the launches of Android NanoDegree in India as App developer initiative program for eligible aspirants. After many successful program from Google, this is one more to step in and succeed after Google Think Mobile. As per their event notes, Google and Tata Trusts to each give 500 NanoDegree scholarships for Indian or qualified Indian citizens for this program. If you are looking for the information on how to get Android NanoDegree program 2015 admission and scholarship detail? Then, here yo go for it. Google is expecting high quality mobile developers for global and local apps. Since India is the second largest developer population in the world with 3 million software developers, India has the potential to become the number one developer population by 2018, with 4 million developers approx. Other than following VIP speeches and their statement, you may find the detail on Android NanoDegree program 2015 admission, how to get scholarship, how to apply, eligibility, age, fees, duration and course waiver etc. herein below. Rajan Anandan, VP & Managing Director, Google South East Asia & India stated as, "India has around millions of software developers, we have less developers or we are far behind in creating world-class apps that can reach top level or top among 1000 best apps. From this program, India's developer will have an easy access to learn and build high quality apps for the world. As of now, there are only 2% of apps built in India that comes on the top 1000 apps globally and our goal is to raise this to 10% in next three years. This is one of the best opportunity for App developer to go through and get the benefit out of it. Mr. Anandan further stated that, we're pleased to announce, that Google along with Tata Trusts will offer 500 free scholarships each to developers for Android Developer Nanodegree program through Udacity." Mr. Ganesh, Development Manager, Tata Trusts said, Tata Trusts is pleased to associate with Google to provide 500 scholarships to deserving candidate in the field of Android development in India which can help the history of apps. "there are about 381 million internet enabled smartphone subscriptions in India, there is a mass demand for the internet as a multi-purpose solution provider. From this joint initiatives, Tata Trusts may come with the digital ecosystem and stands by its core objective of creating a sustainable difference for empowering communities across the Nation." Mr. Sebastian Thrun, founder and CEO of Udacity stated as, "Our mission at Udacity is to democratize education for everyone to help people get the jobs they want and they dream of,". He further expressed as, "We are excited to be launching Udacity in India today and honored to be partnering with Google and Tata Trusts as we bring our Nanodegrees to millions of people in India". This is just online program offered by Google and one can get NanoDegree only if he/she is completely success by achieving various modules and projects assessment and test given Google via online source. Anybody can apply for it as long as they can pass technical assessment and the course would be approx 3 months to 1 year duration as long as one pass it the Degree program set by these organizations. The Udacity Android Nanodegree program is open for enrollment right now. Interested and eligible technical field candidate may apply for the same, including to get the offer of 1000 Scholarship program offered by these two giants. You may check the official website of UdaCity for more information at www.udacity.com/India In addition to this, Google will also host a career summit for thirty of the top graduates from the Android Nanodegree program in Bangalore, by end of this year. Any technical graduates or technical Diploma holders or any candidate who can pass the technical assessment for Android NanoDegree are eligible to apply. There is no age limit to join for Android NanoDegree as long as one is ready to spend few hours online or around 10 to 20 hours per week online to get Android app related training and get things done per their module and projects. The program costs Rs. 9,800 per month (which is affordable) with Udacity refunding 50 percent of the tuition upon completion. The program takes an average of 6-9 months or so. Note: Scholarships for the Android Nanodegree are available immediately, for 1000 eligible candidates with full fee waiver. So, hurry up.